Hibiscus plants are part of the mallow plant family, which is a subcategory of the broad Malvaceae category of plants. The Malvaceae plant family contains 75 genera and a minimum of 1,500 species of trees, shrubs and herbs. Because of the wide range of species available, hibiscus can be found in the wild, in gardens and landscapes, as crops, and in the tropics. There is a hibiscus species that can be grown in any USDA zone or climate, except in the coldest of areas. Flowers in the mallow, or hibiscus, plant family are distinctive in their characteristics, making identification of mallow family flowers easy. Mallow plant family flowers are comprised of five separate flower petals that form a funnel shape and have a distinct column of stamens that surround the pistil. Because of the wide variety of species in the hibiscus plant family, you can grow a type of hibiscus in your landscape or garden easily and have the colorful blooms throughout the summer months. Popular home garden varieties include the old fashioned hollyhocks and the rose of Sharon shrubs, both of which include plants in a wide range of colors and types to meet your landscaping requirements. If you live in an area with a tropical climate, you may wish to try your hand at the traditional tropical hibiscus. 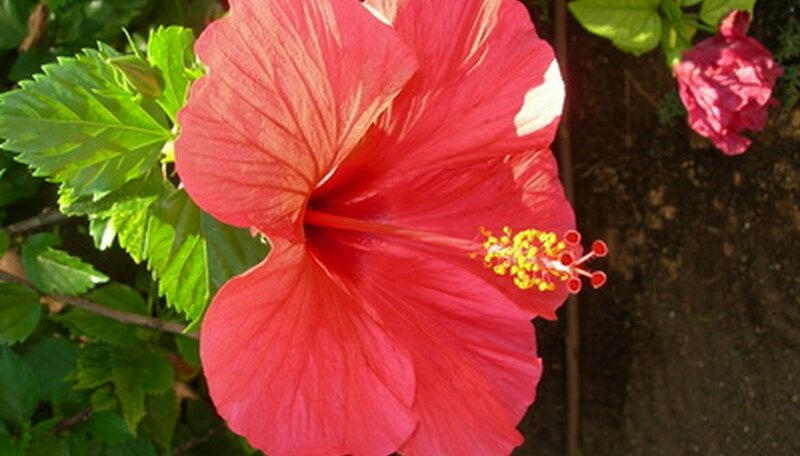 More sensitive to cool temperatures than the hardier hollyhocks and rose of Sharon, tropical hibiscus, also known as Chinese hibiscus, Hawaiian hibiscus or Rose of China, is Hawaii's state flower and is often seen behind the ear of a Hawaiian maiden. Planting these lovely plants in full sun with rich soil that is kept consistently moist will provide you with large, fragrant flowers throughout the summer. The mallow/hibiscus plant family also includes several varieties that are grown as crops. Two of the most common are cotton and okra. The original recipe for making marshmallows used an extract from a mallow plant, though today, marshmallows are made using corn syrup. Hibiscus flowers have long been harvested for making tea. The flower petals produce an aromatic, flavorful tea that is rich in vitamin C.
For centuries, many cultures have used various components of hibiscus plants for medicinal purposes. The somewhat slimy, gummy fluid the plant produces when crushed can be used to soothe sunburns and other skin inflammations. The tea made from hibiscus petals is said to reduce the risk of heart disease and lower bad cholesterol, and it is used as an herbal remedy for high blood pressure. Hibiscus plants can be wonderful houseplants and, given the proper care, will produce the same beautiful, fragrant blossoms as hibiscus grown outdoors. Your indoor hibiscus will need at least six hours of sun per day, a rich, consistently moist soil to grow in, and regular feeding of a fertilizer formulated specifically for hibiscus plants. The fertilizer is very important for your indoor hibiscus and should also contain extra potassium, which will help build bigger flowers, more color pigments and stronger wood.